Make delicious Chilean Merlot wherever you live with this all-inclusive kit. Wine making is a simple, natural process. Add yeast to grape juice, let it ferment in a controlled environment, and boom: wine. Yet wine's mystique can make the vintner's art seem out of reach. Consider this kit a pool floaty for the beginner winemaker: It helps you jump in without fear. The kit includes all the equipment and ingredients you need to make one gallon (approx. five 750ml bottles) of red from Merlot grapes grown in Chile's famous Maipo Valley. Chilean wine has really come into its own in the last few years, and this reputable Merlot is, like most of its varietal, soft and fruity, with a ripe cherry character and spicy notes. The only challenge will be learning your winespeak, so repeat after us: "My 2017 Mi Castillo Merlot is voluptuous yet weightless, with a tightly wound suppleness, exuberant like the Calbuco volcano, with a finish as long as the Chilean coastline." Assembled in Orlando, Florida. Merlot juice from Maipo Valley, Chile. 14% ABV. Click here for your in depth Guide to Wine Making. Have the palate for more? Try our other varietals! 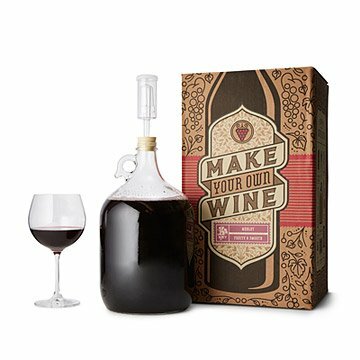 Makes one gallon or approximately five 750 ml bottles of finished wine. We're gonna drink some wine. It came in this box. My co-worker graduated from his Masters program and I purchased this yesterday. I had purchased this previously and had a lot of fun making it, so thought he would enjoy it. I paid regular shipping costs and the kit arrive TODAY! I was completely amazed that it took less than one day! Thanks so much :) my coworker loves the gift and is excited to make his own wine! Bought this for my boyfriend for our anniversary (to do together). We have only started the wine and cleaned it, havent bottled it yet. But so far the experience has been a lot of fun to do together! We hope the wine comes out great! Awesome Kit. But haven't made it yet.